While I was not able to watch the Presidential debates last night, I wanted to share with you a comic I found on "Vkontakte," the popular Russian social-media site (basically Russian Facebook). I love the user-interface on Vkontakte, as it shows news and community updates in your newsfeed from people around the world, even if they are not in your network. One things Russians have is an amazing sense of humor. Seriously. One of my favorite things to do is to read old issues of Krokodil magazine, a Soviet a satire publication. This comic I found on Vkontakte two weeks ago. To roughly translate, the comic says: "Strange people those Americans! With over two months left until the elections, they do not yet know who will be President." 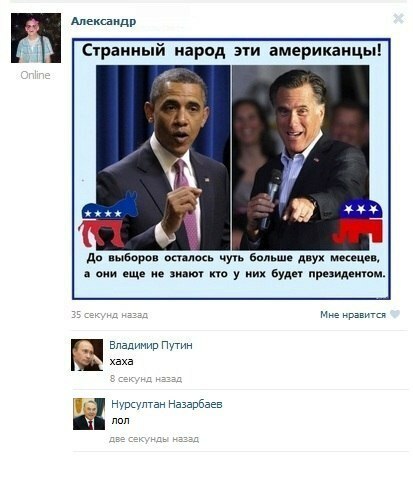 Then in the comments section, President Putin writes "haha" and President Nazarbayev writes "lol" (laugh out loud). Despite your opinions are about the American Presidential elections or Presidents Putin and Nazarbayev, I think we can all appreciate the humor in this image given the popular political rhetoric about "democracy," "change" and "free and fair elections." These political catch-words have become all too common place in popular journals and in the classroom. In fact, if I received a dollar for every time I hear the word democracy come out of these leaders' mouths or every time I read it in a book, I would be a multi-millionaire. I find it particularly interesting that this comic was made by a Russian and includes images of an online social-networking site and was posted on said site. Talk about the power of political communication through digital networks! Also, as a lover of (Russian) political comedy, I am glad to see that the Russians still have it!